When you first visit the website, you are instantly grabbed in by the =-blue colors synonymous with the medical field. In bold font, we see the mission statement and a still image of the advanced technology Vista Dental has in their arsenal. Right under the banner, we see the different services the dental practice has to offer. All in a bold, legible font as always. We dedicated the home page to testimonials, images, and the team’s mission statement – all factors that visitors take in when investing in any procedure. Dentistry websites should always feel inviting and secure. Dental anxiety can be offset with just colors alone. We used a purple and blue color theme on the website to give a sense of youthfulness and playfulness. Purple is synonymous wits soothing appeal. We used green as a highlighter throughout the website to bring attention to certain call to actions. Notice how the navigation menu and contact information are all placed in green. The foundation of the design were two key elements, a welcoming family environment and the concept of ‘fun dentistry’, specifically framed art throughout. When a visitor first arrives they are presented with a framed presentation of the company, its phone number, and its access points, but elegantly handled so it all feels like part of a cohesive design. Below all of the demonstration photos, including the tour of the office, are presented in something reminiscent of that same frame. Overall this concept was carried through very well and has made this website live up to the ‘fun dentistry’ concept presented by their slogan. There is a strong focus on a younger audience and families, hence the ‘fun dentistry’ theme throughout the website. Even the site’s logo is curved and playful! Social media plays a huge role in the audience’s perception of the company – we included the office’s contact information and social media platforms within widgets on the top of each web page. There is also an interesting contact support pop-up that is available to the visitors upon entering the website. 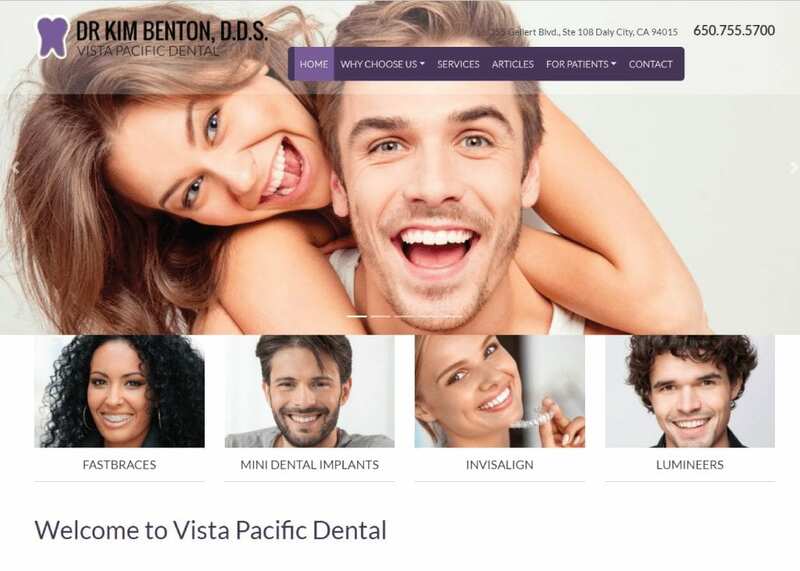 This pop-up can help redirect visitors around the site, while also calling patients to schedule an appointment with the dentistry as soon as possible. Testimonials are also available on the website and can make or break a visitor’s commitment to dental work. The website represents the happy, laid-back nature of the dentistry. Dentistry can be fun too! The website does a great job at portraying a friendly environment that patients can feel secure with. The images, attention to detail, and color theme all give the impression that Vista Dental cares for each and every one of their patients!